” The ground is frozen, the snow is staying instead of melting, and the general population is acting like they have never driven in snow before. *cough* – due to global warming – we have had a lot of rain when we didn’t want it and a dry spell when we needed rain the most. ignoring how shallow a creek or river may be if it is the right temperature to run up into, sometimes scraping their bellies and fins up in the process. but force the all the fish into their deeper winter lies in the river. 1. NYMPH WITH NYMPHS. After months of throwing egg patterns, maybe try using a few more nymphs these days, just to spice things up. 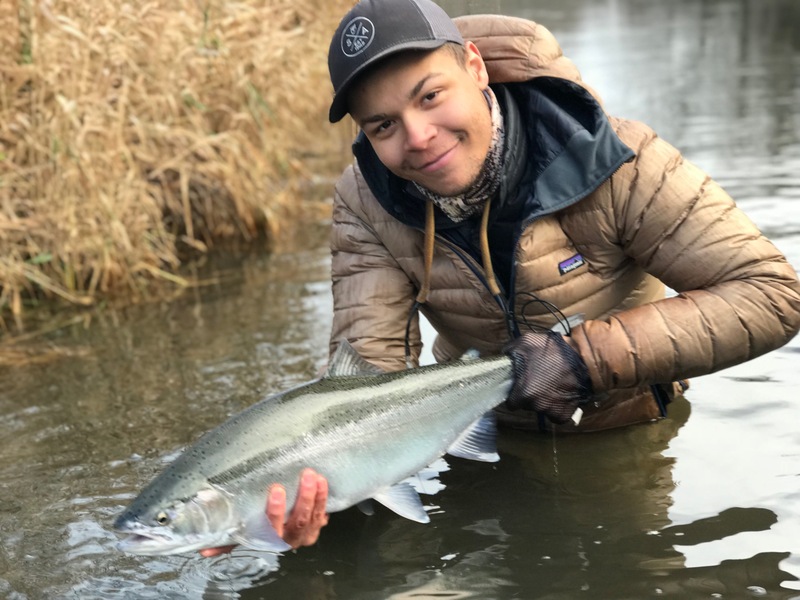 Steelhead are just big trout at heart and the longer they are in a river, the more they revert to their trout-like tendencies, making them more wary and selective with their food. 2. To catch steelhead while indicator fishing you don’t have to be a great fisherman nor caster. You simply need to be a good drifter. Learn to stack mend. And then master it. Your fly being drug down the river by line all day is exactly how to guarantee a day’s worth of disappointment. 3. Logs enjoy chartreuse beads more than Steelhead. Just a proven fact. 4. When your boss hands you a dead grouse, tie flies with its feathers. Or leave it in a bag in your boat to freeze. Your choice. 5. Photos taken of steelhead account for %40 of frostbite cases in Michigan. 6. Whiskey helps catch more fish. 7. Boat plugs can and will freeze and pop out. Things in the shop have been slowing down, giving me some extra time to work on refilling my fly box and make some fly tying videos along with others chronicling my fishing adventures. I am currently starting a YouTube channel, West Side Fly Guy. Look for some new content in the future!